This collection of poetry follows the physician-poet’s journey in treating patients with addiction: Survivors who were—without freedom, without choices—full of life, imagination, and plots and scams. The author works in detox, at various addiction clinics, and sometimes does a stint at the county jail. This collection arises from these experiences. Mary Dowd, MD, is a physician specializing in addiction in the homeless population in Portland, ME. She works in detox, at various addiction clinics, and sometimes does a stint at the county jail. She is married and has four grown children. Her poems have appeared in various journals and in the Hippocrates Prize Anthology 2017. She has led poetry workshops for the Transformational Language Arts Network at Goddard College in Plainfield, VT, and The Examined Life Conference in Iowa City, IA. For many years she led a workshop reading and writing poetry with men in long-term treatment for addiction at Milestone Foundation. Portland, Oregon, 97232 USA; phone 503-813-3286, fax 503-813-2348. About the cover image: Sherri Ferrier, 44, homeless and battling a heroin addiction, meets with Dr Mary Dowd at Catholic Charities in Portland, ME, in 2015. (Photo by Nikki Kahn/The Washington Post via Getty Images). The details, descriptions, names, and settings have been altered to protect patient confidentiality. In the few poems where the patient’s identity may still be clear to their acquaintances, I have received permission from the patient to print the poem. In some cases the patients have preferred that I use their names. Some explanation of terms used and notes on addiction can be found at the end of the text. Please note the placement of the photos in the book is random. None of the poems in the book are written about any of the individuals in the photos. In no instance does the poem preceding or following the photo have any connection to that person. Moving and refreshingly written from a perspective of someone who bears witness to lives overwhelmed by addiction. Verses will prove familiar to health care providers who are challenged by vocational dissonance: a fierce commitment to duty and deep compassion for people who are desperate for relief. The desperation of trying to make a life when we’ve lost control. She sees the futility of trying to make sense of addiction. We notice her characters all around us, but we often turn away or don’t really see. This unflinching portrait of real people says so much in few words and teaches us to really see. We’re right there in the room with these people. Everyone has to figure it out for themselves. All we can do is be human, acknowledge, and accept. If only at a distance we’ve all been touched by issues of addiction. As a doctor, Mary Dowd has allowed herself to come close. She has rubbed her hands up and down an addict’s arms, feeling for veins. She has listened to the stories, to the hopes and despair, and has entered into all the complex contradictions of treatment. Out of this generosity, Dowd has created vivid and compelling portraits that honor the humanity of her patients. These beautiful and devastating poems touch the humanity of us all, reminding us that we each have a “carefully constructed self” and “self-appointed opinions.” We too are in danger of being dead before we’re happy. No easy answers here. As the poems make clear, whatever moral failings there are belong to us all as a society that has nodded out and escaped into our own forms of denial. 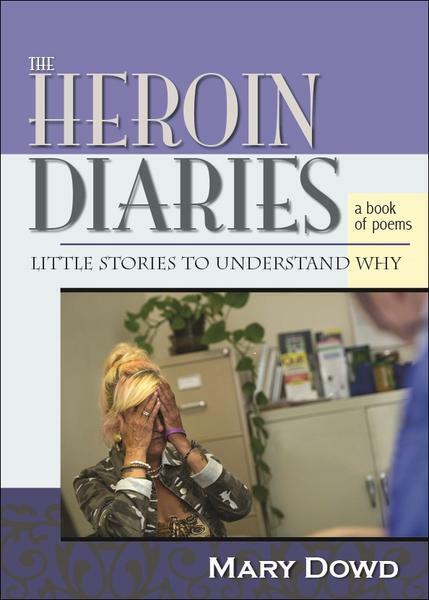 Bless Mary Dowd for the work she does, and for the poems in The Heroin Diaries that are really about hope because they are poems of love, poems that give us back to each other, despite what addiction takes away.